Iran’s air defense chief, Brig. Gen. Farzad Esmaeli said today in Mashhad that his command tracked a U.S. U2 spy plane over Iranian skies last week and warned to shoot it down by missile, forcing the U-2 to leave the airspace. The Pentagon has not confirmed the claim yet. In March 2013, Iran also said it had tracked and warned another U-2 spy plane. 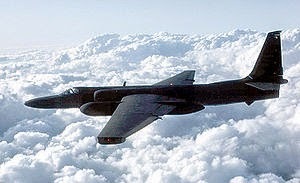 Iran not only tracks U2 but also some of the other "secret" birds in the US arsenal which are stealthy. Basically Iran has set up a grid of smart transmitters and receivers around the potential blind spots throughout the country which will reveal the position of stealth aircrafts. This system combined with a range of other techniques will make it difficult for any current stealth aircraft to be in the Iranian airspace for a long time without being detected. I am confident Iran will soon shoot down a stealth aircraft to send the message to the other side it takes these violations seriously. I would beg to differ. Shooting down a plane hovering at high altitude in its sovereign airspace, potentially capturing its pilot ejecting and landing in the middle of Iran and fear for retaliation ? I don't think so. Manoeuvering scope for US authorities would be in such blatant case of certified of illegal behavior would be very , very narrow. You don't retaliate for an abuse gone public in which you screwed. In my opinion things won't move an iota more than a few years back when they snatched a dozen british marines. as long as the negotiations are going nowhere, the overflights and other reconnaissance measures will be stepped up. Iran is most probably letting these "intelligence-gathering" activities to go on in order to provide some comfort to the other side about its peaceful nuclear program. This is the best way of building trust. Having said that once the baseless allegations on the other side continues Iran will not see any value on letting these intelligence activities to continue collect information on Iran. At that time, which is not far away, Iran will ensure damage is done to all these types of activities be it in the air, sea, ground or in cyber space.